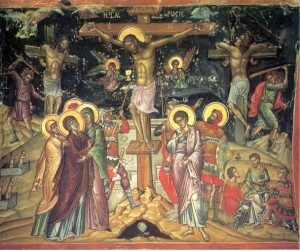 Behold the wood of the cross, on which has hung our salvation: come let us adore (Liturgy of the Lord’s Passion). As we trod with Jesus the steps to Golgotha that draw Lent to a close, it is worthy to note that these are not the waning days of a dry, tired Lent. Instead, they inexorably ripen; they wax heavy and full with our veneration of a most contradictory crucifixion, the definitive gesture of the “God Who Exists.” They are about to burst forth in a gush of LIFE, but not yet; these are the days of the grave. Pilate, as later modern secular philosophy would echo, said, “What is truth?” Truth is Crucifixion. Angry death. The God who created the cosmos and every created, living, breathing, and existing thing out of and unto His own living, breathing existence, gave Himself up to the worst that humanity could do: man murdered God. Much as the atheist cries, God was truly dead. Like Christ who went before us, we Christians admit the scandal of this death. We embrace it, because simply, Jesus did. He accepted our scorn. He received it all within eternal outstretched arms — our meanness, our ugliness, our revulsion and hatred. He welcomed it. He continues to welcome it, because it is no match for Him. He reigns from it; love is stronger than death. What other religious demonstration in all of history is worthy of deity but this supreme, matchless humility? While he makes Himself a curse for love of us, we trample Him. What other god gives Himself utterly to the revenge of men? From those who would make themselves gods, humanity demands signs and titillating sound-bites of intelligence, but God Who is God offers the foolishness, the scandal, of Himself crucified. Only a God worthy of the Name could, or would, put forward such an expression of weakness and humiliating invitation — an eternal, bloody embrace — as the ensign for Himself. He is not angry. He is not vengeful. He is not hurtful. He is crucified. He is bloody. He is lonely. Jesus Himself explained the scandal when He offered, “As Moses lifted up the serpent in the wilderness, even so must the Son of Man be lifted up…” Why is that? Together, the serpent and the wood were cursed — a horrifying ancient symbol of fear, judgment, evil and death. Artistic renderings of the Garden of Eden nearly always depict the deceitful, mortal serpent entwined upon the Tree of Knowledge of Good and Evil. It was an open-mouthed, striking serpent that would one day murderously confront the Woman and her Seed. Moses’ tribal staff transformed into a snake and then back into a staff in the presence of the idolatrous Egyptian Pharaoh (Ex. 4:2-4). He used this same staff in error to strike water from the rock for the people to drink (Num. 20), a fit of temper that cost Moses the attainment of the earthly Promised Land, since there was no need to violently wrest from God what He would willingly provide. Because Moses was also Aaron’s brother, it would have been that same tribal staff that indicated God’s selection of Aaron as the first priest and that was placed as a memorial of the priesthood within the Holy of Holies. Later, when “[t]he soul of the people became very discouraged on the way” to the Promised Land (Num.21:4), they complained and grumbled in their weariness, and wandered into a den of venomous snakes. As fever and death from the poison rampaged through the camp, the people cried out to God to save them from the revolting snakes. God heard and answered them with great deliberation. At God’s instruction, Moses affixed one of the frightening serpents to a “pole” (Num. 21) and raised it at the door of the tabernacle (St. Justin Martyr, First Apology, LX). Could it also be that the “pole” was the staff of Moses and Aaron, prophet and priest from the same tribe, removed from the inner sanctuary for the salvation of the suffering people? The raising of this contemptible figure would have surely caused the people to shrink in revulsion, but they were invited to confront their pain and fear in order to be healed. It was this stunning image that Jesus pointed to in His dialogue with Nicodemus as an analogy to His own saving death: “If I be lifted up like the serpent in the wilderness…” Because anyone who hung on a tree was cursed (Duet. 21:22-23), Jesus became a curse in order to be lifted up from the earth as a banner to save those who would look to Him. For this reason “the Lord was pleased to crush him in infirmity.” Jesus did this readily at every step, foretelling the awful, accursed method to Nicodemus, without any doubt of the Father’s love for Him. Jesus teaches us that what hurts most us can also heal us indeed, that we can be unafraid to abandon the restless yearnings of our deepest needs, weaknesses and desires into our Father’s infinite hand. Whatever sin keeps you from this matchless Love, whether your own or that which has been done to you through someone else’s ugliness, abandon it to the Father just as Jesus offered His very life and received it back as the nourishment that sustains human life forever. The Body and Blood of Christ are the source of a supernatural life, called “the new covenant” and “eternal” in the Scriptures for its quality. It is life that is stronger than the power of death, even a cruel one. Faith to faith, it can raise the dead in our own past, circumstances, and experiences, but only if we look to Him in the putridity of death, hold His hand in the hurt and humiliation, and pass with Him into life. Look upon the healing execution. See what evil does to the earth, to the world, to goodness, and know that it is also VANQUISHED. It is Good Friday. Let us lift our eyes to the Son of God upon the cross, for “He has power over life and death; He leads men down to the gates of death and back again” (Wis. 16:13). At first reading this I was a bit “turned off” with the comment “God is dead.” But as I read on I understood more and why the comment was made. I was a small boy when I first heard the phrase “God is dead.” It was Holy Saturday, and my Aunt told me. My immediate concern was a practical one: “If God is dead, who is running the world?” I remember actually becoming worried. Well, the explanation is a little complicated and beyond the ken of a small child; it has to do with Jesus, God-as-man dying in His human nature, and not death to the Godhead Himself. We’re used to the Easter story, but every year it is a jolt to walk into a church on Holy Saturday and see the empty Tabernacle. Maybe we need to be jolted like a little child and receive the reality of it as something we’ve never heard before, something we never dreamed (in our worst nightmare) could be possible. Because that’s what it is, a nightmare, the darkest hour in human history. I’m thankful that the Triduum is only three days. I’m not sure I could handle much longer. WHY GOD HAS TO DIE TO KILL EVIL.?? HE COULD KILL EVIL,IF HE WANTED.!! NO LOGIC.! !